Understanding the basic chemical interactions in clathrate compounds is important in areas as diverse as energy storage and pharmaceutical development. 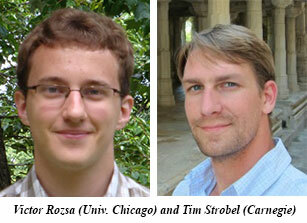 At Carnegie, Timothy Strobel and CDAC intern Viktor Rozsa (Hillsdale College, now at University of Chicago) have recently discovered extremely novel behavior in hydrogen-loaded hydroquinone (β-HQ-H2) clathrate under pressure. While the vast majority of materials contract under hydrostatic compression, the volume of β-HQ-H2 clathrate actually expands nearly 1% when compressed between 2.5 and 3.0 GPa. Over this pressure range, the negative bulk modulus and negative linear compressibility along two crystallographic axes are a consequence of a change in hydrogen occupancy from one to three molecules in the structure. The β phase of hydroquinone (HQ), or quinol (1,4-benzenediol), has a clathrate structure that is capable of trapping small molecules less than ~4 Å in diameter. Clathrate cavities in β-HQ clathrate cavities consist of six HQ molecules with [OH]6 rings terminating the top and bottom of the cage along the c axis and benzene rings comprising the cage equator in the a-b plane. 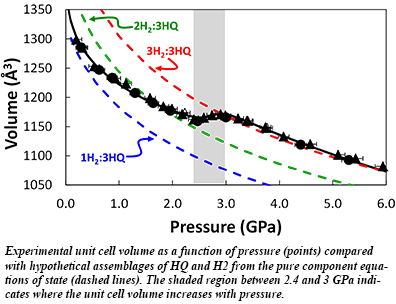 With increasing pressure under hydrogen loading, the characteristic hydrogen vibron increases discontinuously in frequency at around 1.4 GPa, concomitant with a more repulsive local environment for H2 [Rozsa and Strobel, J. Phys. Chem. Lett. 5, 1880-1884 (2014)].